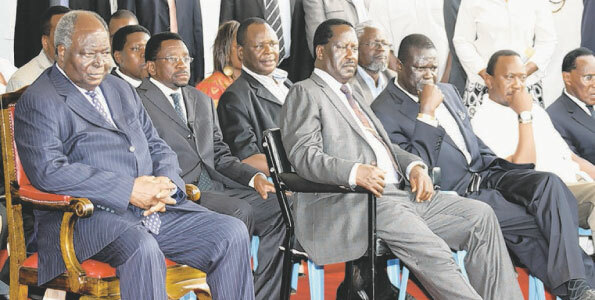 Kibaki, Raila and others each wondering about KSG at past event. On August 5, 2011, I met a friend I knew to be good friends with both the PM and the MP for Sabatia Hon. Musalia Mudavadi at a popular after-hours gathering place for many a politician and business types near Yaya Center. In the course of our hanging out with others joining in and out of our chat, I asked my friend how things were going politically and his response jolted me momentarily: “Don’t be surprised if Raila is not the ODM nominee,” my friend almost passingly told me. And then my friend shared with me reasons why. This was the first time I knew something was afoot with MM in connection with KSG. Although my friend did not make any connection or mention MM’s role in the larger scheme of things in the succession politics, and specifically even though he did not mention anything to do with KSG and its schemers I now know, my friend did make it emphatically clear that he was aware of a plot by some in ODM to replace Mudavadi as Raila’s running mate and this, my friend told me, would be a suicidal move on the part of Raila and ODM. Agreeing with my friend on this second point, and putting aside his shocker about the possibility of Raila not being the ODM nominee, I penned Why Raila Cannot Drop Mudavadi and Word To Raila Supporters In East and Central in which I made the case why Mudavadi should not be dropped as VP running mate for Raila. It should be noted that at time and that is by September 2011, the issue within ODM was whether or not to keep Mudavadi as Raila’s running mate, not whether Mudavadi or anyone should challenge Raila for the party nomination. It was a given as the ODM constitution provides even to-date that Raila as party leader will automatically become the flag-bearer for the party as presidential candidate. Indeed, a compelling case can be made from contemporaneously occurring events that Mudavadi himself counted it as a major victory to simply survive efforts to replace him as VP running mate. Things changed, however, on January 23, 2012 with the ICC confirmation of crimes against humanity charges against Uhuru and Ruto, the two politicians who are united only in their declared quest to “stop” Raila. Recall from Part I by this time, Ruto had already crashed and burned as ABR and the schemers were in over-drive trying to find a replacement. The replacement came following the call to Mudavadi who as I previously blogged all gleefully willing to challenge Raila and with enough “support” he was promised, he assured the schemers he could topple Raila as party leader and grab the party nomination as ODM presidential candidate. What he didn’t know at that time was the conniving schemers also had in this KSG plans to politically destroy him once nominated and pave way for their own preferred true candidate and this in their calculation would have been pretty much anyone they fancied, having removed Raila as their main obstacle and ODM being in tatters upon destroying Mudavadi, its presidential candidate in this scenario. But, when it came to implementation, the schemers found they had on hand a situation none of them really contemplated even as they knew Mudavadi was no Raila when it came to Kenyan politics. The plan, according to a reliable source, was twofold: On the one hand, Mudavadi was to take Raila head on with no holds barred making the case Raila is unelectable because he had “irreversibly lost” both the RV and Mt. Kenya region votes in total but he (Mudavadi) could regain these votes with ease and sweep the nation come general elections. On the other hand, according to the same source, the plan was to both buy enough ODM delegates across the country to tip the scales for Mudavadi as well as to make sure none of the delegates from Mt. Kenya region even as cast a single vote for Raila and the latter was to be accomplished by a combination of vote buying and threats or even violence if necessary. Unfortunately for the schemers, however, Mudavadi being the weak, indecisive person he is, came off the gates comatose. Rather than taking the fight to Raila for the party nomination by drawing sharp distinctions between he and Raila, Mudavadi essentially came out mumbling something to the effect he was merely trying to make sure there was “internal democracy” within ODM by offering himself as a candidate. He even went as far as promising he would not say anything negative about Raila and that his will be simply a contrast in style and sense of direction. A first year Political Science student could have told him this would not work, given the schemer’s objective to annihilate Raila because neither they nor anyone else in KSG was interested in internal democracy of anything. They wanted Raila’s political head and this was the feeblest way it could be delivered, namely, talking gibberish. One can understand why Mudavadi was sluggish off the gate: It would be the first time in his political life that he would have to undertake something of this magnitude on his own. Those fronting and backing him were behind the scenes and never to be seen or known in public unlike the past where they publicly wagged and tossed him around as a little toy. They wisely rejected and so did the country. Mudavadi’s challenge of Raila was so timid, lackluster and simply unthreatening many, including loyal ODMers saw nothing wrong with it and even encouraged it. Putting two and two together from just observing what Mudavadi was saying and doing and with some hints from a source in Mudavadi’s camp who was not divulging much, I sounded the alarm in Mudavadi Has No Good Reason To Challenge Raila for ODM Party Nomination posted on January 27, 2012 in which I basically noted the Mudavadi’s challenge was a sham and unhelpful for Raila and the party. Immediately after posting that blog, I received notes from at least one top Raila and ODM confidant telling me in his view, what Mudavadi was doing was healthy for the party and that I should support the idea. I would have to admit this coming from this trusted friend of the PM, and someone I know and respect his views very well, I found myself seconding guessing the position I had taken about this MM challenge being a sham but my hunch remained unaffected. About 2 weeks later, I penned An Open Letter To Hon. Wycliff Musalia Mudavadi in which I implored Mudavadi in my naïve belief he would listen much as others were imploring him to put aside this what some of us smelled a rat for not being a genuine effort to challenge Raila. I would later confirm through Mudavadi’s confidant I first mentioned above that MM read the letter and took issue with something I said in it that he thought was an unfair attack of him. In fact, not too long after sending and posting that open letter, I run into Mudavadi in person on one of my visits home and knowing fully well he had read my letter, I asked him as we were shaking hands if everything was okay with him and the party. With a smile that told me all I needed to know, and probably a desire on his part to land a left hook across my belly, MM simply nodded in the affirmative and said yes and that’s all was said between yours truly and him as others joined in the small room for a brief impromptu party meeting. Mudavadi, of course, was smiling all the way to the bank as it were. On 20 March 2012, there was an anti ODM meeting in Jimmy Kibaki’s office in Gigiri. In attendance were Mr. Sammy Koech, Jimmy Kibaki, and a representative of Hon. Mudavadi as well as Hon. Kenyatta’s. The main topic was how Mr. Ruto, Mr. Kibaki and Hon. Kenyatta can support Mudavadi to run down ODM. Detailed plans that continue to unfold were laid. Hon. Mudavadi cannot deny this. Nor can he deny that the Gigiri meeting on 20 March was informed that he has held several secret meetings with Mzee Moi, where they have discussed how to scuttle ODM. Another meeting took place last week, on 02 April from 6.00 pm to 2.00 am, with Hon. Uhuru, Hon. Njeru Githae, Gen. Karangi and Mr. Paul Ndung’u in attendance. Hon. Mudavadi has also held a variety of secret meetings with Hon. Ruto at Palacina and Crowne Plaza Hotels in Nairobi, with the agenda of destroying ODM and stopping the Reform Agenda in Kenya. I stated in that blog that Mudavadi could not deny any of this and he never did as it was all true. Meanwhile, ODM by this time had figured what Mudavadi was up-to and true as any savvy political party could be, it turned the tables on Mudavadi. In Part IV, I will continue chronicling KSG and finally reveal what I know to be the current state of KSG. And with that, MM was converted from a pawn to be used in the high stakes game of KSG to, in the minds of the schemers, their only hope to defeat Raila altogether in the general elections. To say the man is now not only the unchallengeable ABR but also the de facto Vice President of the Republic of Kenya would be feebly stating the case. Where does that leave Kalonzo Musyoka? Plus, how does the death of Saitoti affect KSG? Short answer: Look for who is appointed to replace Saitoti as minister for internal security and Ojode as his assistant. All your answers will be right there. Hey Sam, i love your political analysis..but then, i’ve got a question for you and next time i would really wish that you blog about it. Moi, yes the former president yesterday confessed that he had a discreet compassion for the late Prof. Saitoti’s presidency and it has been his secret prayer that one day the deceased leads Kenya. So, where does that put Moi in KSG equation? Was Saitoti another victim of political assasination and by who? ?